The Iranian Army has refused to comment after a member of the country’s National Security Committee said today that Iran was to practice closing the Strait of Hormuz, the most important choke point for oil shipments in the world. “The legislator, Parviz Sarvari, told the student news agency ISNA: “Soon we will hold a military manoeuvre on how to close the Strait of Hormuz. If the world wants to make the region insecure, we will make the world insecure,” reports Reuters. 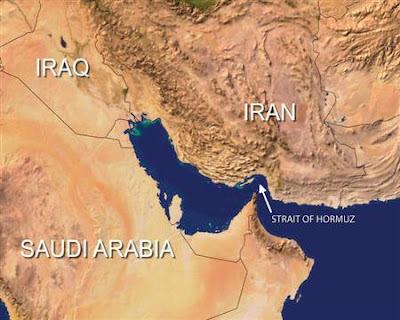 The Straight of Hormuz, just 34 miles wide at its narrowest point, is a key transport passage for petroleum exporting countries from the Persian Gulf, with the 15.5 million barrels of oil that pass through it each day representing 33% of the world’s total oil shipments. The Iranian military refused to comment on the report, but Iran has repeatedly threatened to close the shipping channel in the event of a US or Israeli-led attack, a potential action the United States has characterized as an act of war. Following speculation that sanctions would be placed on Iranian oil exports, Foreign Ministry spokesman Ramin Mehmanparast warned last week that oil prices would soar above $250 dollars barrel. Experts have forecast that a 30 day closure of the Strait of Hormuz would send oil prices skyrocketing to between $300-$500 dollars a barrel, a level that would trigger global economic instability and cost the U.S. nearly $75 billion in GDP. As we reported last week, the United States has deployed a total of three warships to the Middle East, along with several other attack boats, as tensions in the region escalate. With the USS John C. Stennis already stationed just outside Iranian territorial waters, the the USS Abraham Lincoln and the USS Carl Vinson are on their way to join her. The United States now has a total of five major aircraft carriers deployed around the world, the same number of warships that were in action shortly before the invasion of Iraq in early 2003.